The former President of the United States lay near death. His body wracked with fever from a gash on his leg. Starvation leaving him weak and somewhat delirious. Hundreds of miles from any place remotely resembling civilization. Surrounded by rainforest jungles filled with predatory animals, the most dangerous of which were the natives, some of who were known to be cannibals. Those traveling with him, near starvation themselves, wrote in their journals he would not make it through the night. Roosevelt, himself drifting out of consciousness and delirium, contemplated sending the party on its way so he could take a fatal dose of morphine. How did Theodore Roosevelt find himself in this situation alongside The River of Doubt, a tributary of the Amazon River in the remote Amazonian jungle…just 18 months removed from the election of 1912 (Marty McFly Changes History on the #RooseveltRiver) and five years removed from being President of the most powerful nation in the world? I’ll tell you how…poor planning and lack of organization! Yes, I said poor planning and lack of organization! In early 1913, fresh off his personally humiliating defeat, Roosevelt was offered an opportunity to deliver a series of speeches in Brazil and Chile. As was his pattern when faced with life crisis, Roosevelt sought adventure and physical challenge. This time was no different. He began contemplating an expedition while visiting South America. Enter Father John Augustine Zahm. 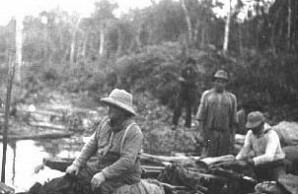 Zahm had approached Roosevelt several years earlier regarding the possibility of an Amazon River excursion. Coincidences brought them together again just as each man was formulating ideas for an adventure. Roosevelt agreed to a river expedition and put Zahm in charge of planning. As planning continued, Roosevelt thought of the expedition as a “delightful holiday”. Zahm, in the meantime met a sporting goods store clerk who Zahm immediately invited to join the expedition and put in charge of the procuring the provisions and equipment. As the time neared, the expedition hired a guide, Colonel Candido Mariano da Silva Rondon. The hiring of Rondon is probably the main reason Roosevelt survived, however, Rondon assumed Roosevelt was merely on a hunting expedition like the safari in Africa he had written about years before. The final ingredient in our recipe of disaster came as Roosevelt’s party arrived in Brazil. They decided rather than a wilderness trip through dangerous but known waters, they would explore a river in which no civilized man had ever dipped a paddle, the Rio Da Duvida, the River of Doubt. To help fund the trip, Rondon would map the river from the headwaters to the confluence with the Amazon during the expedition. Contrast this with the Lewis and Clark Expedition over one hundred years prior. That expedition had been planned from start to finish, down to the nth degree of detail. The two Captains, were of singular mind, with a singular goal. While by the very nature of an expedition into the unknown, you cannot plan for every occurrence, they had each other and they had the men, all with a singular purpose. When trouble arose, and it did, they relied on their planning and their organization to overcome and proceed on. As business leaders today, we cannot take our companies on expeditions into the unknown without proper planning and organization. We start with a vision that answers the question “what”, we create a strategy that answers the question “why”, and then develop a plan that answers the question “how”. We cannot divorce ourselves from the planning process. We may not be involved in every detail, but we must stay engaged. We select qualified and strong leaders and, while we give them autonomy, we do not relieve them of accountability. We put processes in place to help the men and women of the expedition to respond to the challenges day to day. We create an organization that can react and respond to the unknown. We continually review the information before us and adjust the plan when and where necessary, never losing sight of the ultimate vision and goal. Roosevelt did survive his lack of planning and poor organization. It could have just as easily been an entirely different story, a story of a former President of the United States perishing in the jungle, or disappearing into the unknown never to be seen again. As with Roosevelt, some organizations are able to overcome the lack of vision, strategy or a plan and survive. Most, however, are acquired, bankrupted, or they just plain disappear into the unknown. new to me. Regardless, I’m certainly delighted I discovered it and I’ll be bookmarking it and checking back frequently!